Inboard end of flaperon, top. Click to expand. One of the many important details yet to emerge publicly about the Reunion flaperon is how it floated in the water. 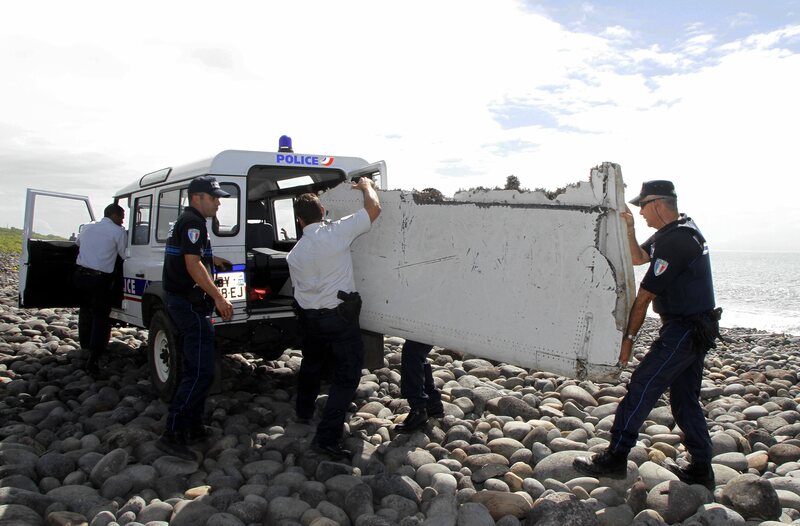 Presumably, French investigators have immersed it in saltwater to see how it settles. Since the results of that test haven’t been released, the only clue available to us is the the sea life visible in photographs. As I’ve written, the flaperon is liberally encrusted with goose barnacles. These animals are a type of crustacean that attaches while young to a floating object and spends its entire adult life affixed to the same spot. Since they obviously can only survive underwater, every part upon which they were growing must have been well submerged for a considerable period of time. Above, the inboard end of the flaperon, as seen from the top looking down. This is where the ID plate should have been attached. Barnacles are growing all around the rim of this end, and to my eye extend beyond the plane of both the upper and the lower surface, so this entire end appears to have been submerged. The next picture shows the other end, the outboard end, again looking from the top down. Outboard end, upper side. Click to expand. This one really deserves to be seen at full resolution. This is clearly the least barnacle-covered side of the flaperon–the critters seem not particularly to favor undamaged, painted surfaces. But it seems to my eye that even here they have colonized all the way around the edge of this face, in greater or lesser densities. In other words, it’s barnacles all the way around. 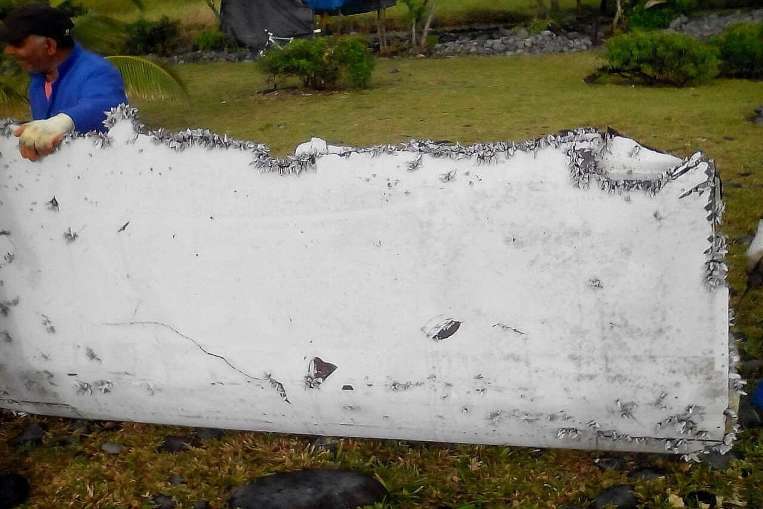 It shows a Japanese skiff that was carried out to sea by the 2011 tsunami and washed up in Washington State 15 months later, so was adrift for about the same amount of time that a piece of MH370 would be today. 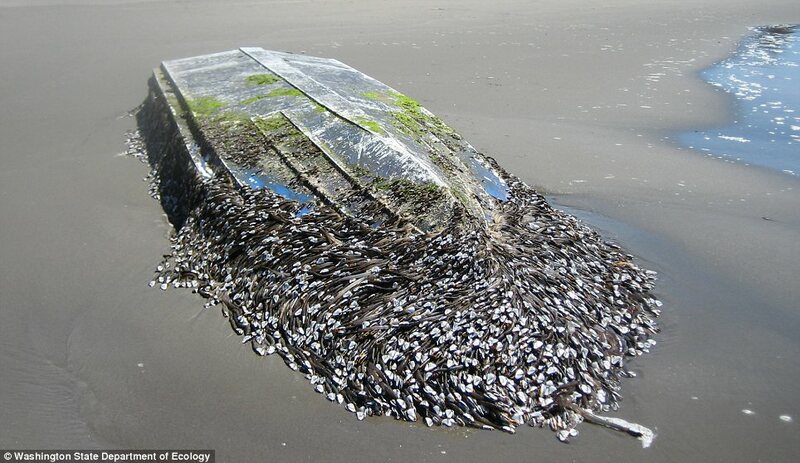 Like the flaperon, it is covered primarily in goose barnacles, though perhaps of a different species. As it happens, I was on the phone yesterday with famed ocean-drift expert Curtis Ebbesmeyer, professor emeritus of oceanography at the University of Washington, talking about the flaperon, and he specifically cautioned me that it is not possible to nail down the route and time afloat of drifting debris from the animal life growing on it, because things grow at different rates depending on, or instance, how nutrient-rich the water happens to be. Still, the difference in population density is striking. One other thing I’d note is that it appears that the skiff floated with its stern in the air with a foot or two of freeboard, with algae growing on the surface just below the water, and the goose barnacles growing a foot or so deeper. On the flaperon, in contrast, we do not see an intermediate zone of algae growth. Sorry for being so clueless, but what is the importance of how it floated? 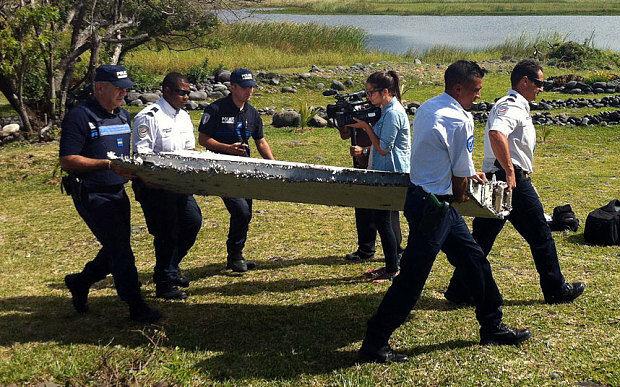 To me, the flaperon is important because it confirms that MH370 crashed into the Indian Ocean. It may be important if it sheds any light on how or why. Will knowing how it floated help with that? Or do we suspect that it sinks like a stone and therefore has appeared as part of the conspiracy? @Bruce Lamon, It’s important. Bear with me. In your last image, I see no barnacles on the underside, nor any on the edges extending past the underside (i.e into air in a upside down floating scenario). At the top along the clean linear break, there are some but extending towards the top of the flaperon (downwards into water, in the above scenario). 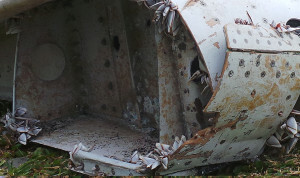 Inside the hinge bracket slot, bottom right of image, there are several barnacles, but none extending past the underside. All this would seem to match Mike’s model #2, where the flaperon model floats flat and around 90% submerged. The slot would be awash allowing barnacles to grow there, the trailing edge would probably also have been – just – awash and allow barnacles to grow towards the flaperon’s upper side, i.e. downwards into water. Could a 777 fly and land without a flaperon? I guess it would cause a few problems (I’m in IT, not aviation!) but could it have come off another plane that lost this part mid-air? Are there any records of emergency landings (rather than actual crashes) of 777s in this area? I am suprised at the small number of GB (Goose Barnacles) in total. Over a year at sea is a long time. See this boat drifting a year at sea. I would say it floated flat horizontally, not flat vertically and definitely mostly submerged (sans that one side with minimal barnacles) to pick up all the shells and barnacles as Mike says and as the French basically describe with their “entre deux eaux.” I’d go with the 90% submerged. During its 17 months at sea, the flaperon probably was tossed about quite a bit by wind and waves. Also it may have been bi-stable, floating upside up at one time, and upside down at another. Even the buoyancy may not have been constant, as internal spaces may have filled and drained depending on its orientation to gravity. It seems to me it could be easy to make an experiment. Either of the two Australian ships making searches in the search area could do that. An object similar to flaperon in terms of the surface constituents, and covered with the same paint could be but underwater and tied to one of the ships or so. The purpose of the experiment could be sealife attached to the object, how it develops in terms of time. The object could be photographed daily and some measurements could be done daily. I do not think it would cost much. Model #2 is bi-stable…suggesting the flaperon probably did flip from one side to the other many times in the big IO waves. What are the possibilities this flaperon is a teaser, a plant, to throw off the investigators or further confuse the search? Couldnt imagine anyone so stupid to do that. So easy to disprove. It is hard to imagine the search being more confused than it is. I share your opinion. The whole sidebar into the floating flaperon physics seems like something to do while we are waiting for something important to happen. The fact is it floated. Who cares if it was 90% submerged or 80% submerged or 87% submerged? Jeff, can you point out why the orientation of the flaperon drifting in the water is considered important? Is it to do with whether there is enough surface exposed on the flaperon for it to be carried by the winds, as well as the ocean currents? In the location of the current search area, the prevailing winds are a strong westerly. So if this is the case, and he flaperon was in the water like an iceberg floats on water, then wouldn’t the flaperon then have ended up in Western Australia rather than Reunion Island? And that’s IF it was in the SIO in the first place. Is this why the orientation of the flaperon in the water important? @Velocity, @DennisW, The issue is not how much was submerged, but how much projected above the surface. Based on my eyeballing of the debris, the answer appears to be “zero.” And this is problematic, because inanimate objects cannot float neutrally. This is an issue that was raised by an anonymous source in La Depeche article. I have to question the assumption that “they obviously can only survive underwater.” Perhaps these goose barnacles are of a variety that truly can’t survive without constant submersion, but generally, goose barnacles are commonly found in the intertidal zone, meaning that they spend hours every day outside the water during low tide. Given that the flaperon is relatively thin and certainly at least partially submerged, it’s easy to imagine that water frequently sloshed over the top. Therefore, barnacles could have lived on every surface, even if it was floating with the same side up the whole time. 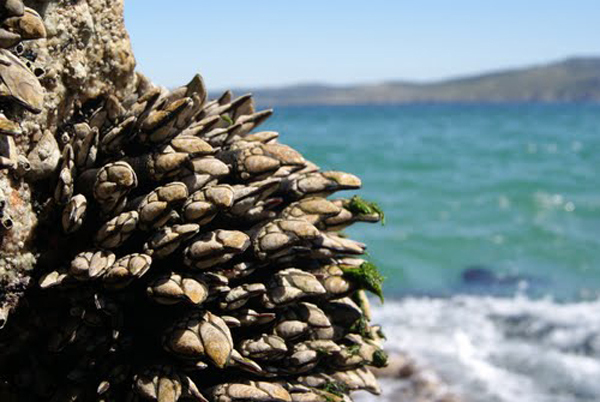 In time, the growth of barnacles, algae, mussels etc will gradually add weight to the object and can eventually sink it, at which point it falls the bottom. There the accreted growth can die and drop off, and the object can resurface. So it is possible for an object to float mid-water column, but dynamically, not statically. Perhaps this comment on PPRuNe makes sense? This news article dated 28 March 2014 shows a piece of floating debris that looks remarkably like the flaperon that was found on Reunion. It seems to be floating “neutrally”? Or perhaps my understanding “neutral flotation” is incorrect? 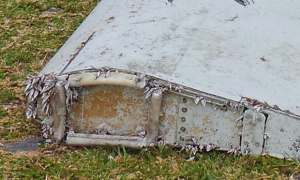 Could the flaperon have been partially attached to the wing, keeping it submerged until being dislodged or broken off from metal fatigue by means of current/tidal flow? If that was the case, would that suggest that the part was submerged somewhat shallow? I was interested how clean the flaperon and the fragment found at Vabbinfaru were so I had a look at the composition of aerospace paints. 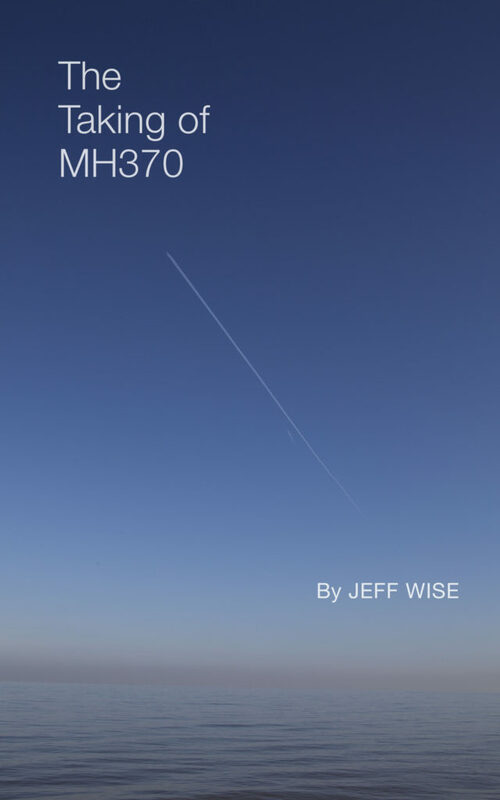 The paint that would have been used on a plane of mh370 vintage would have contained chromate. In a marine environment, this would have acted as a mild anti-foulant. Apparently, the gooseneck barnacle can survive in the intertidal zone so it really doesn’t need to be continuously submerged to survive. @Pat Janseen, We’ve discussed the intertidal zone issue and the consensus seems to be that Wikipedia is wrong on this point; goose barnacles do not live in the intertidal zone. I can’t speak for all species, but goose barnacles certainly can survive out of water. Here in Spain, Pollicipes pollicipes (percebes) are a delicacy and you see them all over the rocks on the northern coast and estuaries (Galicia and Asturias). As the tides recede, they are exposed on the rocks for many hours. People scale down the cliffs and climb exposed rocks to harvest them. It’s one of the most dangerous jobs in the world. You can see them alive and kicking out of the water on any beach or rocky cove in that part of Spain. If all the 777’s are accounted for, are there sources of flaperons available to an individual or a group that may wish to fake evidence to mislead? Who would gain from such an act other than to put an end to the mystery or a hoax for fame to show it can be done? I would guess there isn’t a great number of stockpiles of this item that inventory can’t be verified for a missing item. Very convenient that an ID tag just goes missing. MH 370 WILL NEVER BE FOUND BECAUSE IT WAS JACKED TO THE 25TH DIMENSION BY BEINGS FROM THERE WHO COLLECT PEOPLE & STUFF FROM ALL OVER THE UNIVERSE & ALL TIME. @Mariposita, Floating debris is not like a rock in a tidal zone; it is not periodically immersed. Whatever’s above the water line stays above the water line. Kimber hit the nail on the head. I was an underwater hull cleaner for 12 years. I know more about the nature of marine growth than anyone should ever know. In short, lots of goose barnacles (and other types of barnacles) thrive in the tidal zone, where they go through alternating periods of wet and dry…for many hours at at a time. An object bobbing in the water, near or on the surface, only needs to be at least partially wet some of the time for barnacle larvae to find a purchase. It doesn’t take much time or a lot of water. And the growth rate varies considerably, depending on species, water temperature, and nutrient levels. The same species will grow at different rates throughout the season depending largely on temperature changes. Cold water slows things down. 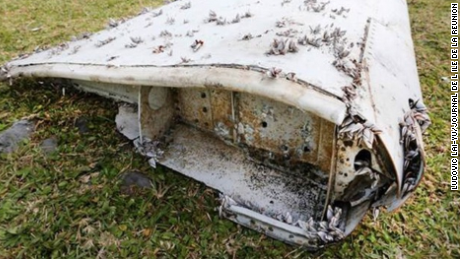 As someone who spent way too many years watching barnacles and mussels grow on things, I’d say that the amount of growth on the flaperon appears highly plausible. Were it to have floated through the North Atlantic, or the Central Pacific, or some other region, the growth types and quantity might be different. 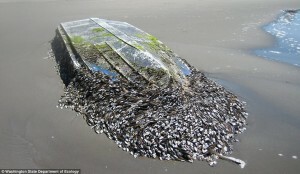 But it’s not surprising that the flaperon is covered with goose barnacles, or any other barnacle for that matter. It’s not a mystery, it was simply inevitable. DonB, You’re being ridiculous. Barnicles don’t grow in air. Very interesting. Finding one piece only is more suspicious than finding none at all. Also, can you explain why the GeoResonance Bay of Bengal claim has never been investigated? @Tom S, GeoResonance was a pretty transparent hoax. I hope that you’re being facetious, but just in case you’re serious…Why would you assume that the falperon spent all of its time in the open air? Did you witness its attitude in the water prior to its arrival on the beach? So, none of its surface was ever covered with water at any one time? One portion of it always remained high and dry? Having spent over a year in the ocean, experience who knows how many storms and rough seas, that seems highly improbable. Besides, much of the debris that is drifting around out there spends a lot of time largely submerged. It’s just buoyant enough to remain in the upper tier of the water column as the currents push it around. Only the most buoyant materials remain largely exposed: things like plastics, wood, Styrofoam, etc. I worked underwater for 12 years in some of the most garbage-infested waters imaginable. I’ve seen how debris moves through the water first hand, so I’m not going to argue with you about it. Sorry, Mr Wise — you lost all credibility when you insisted that barnacles can’t grow and live on a surface that isn’t submerged 100% of the time. Anyone who has ever seen any kind of flotsam or marine litter is aware of this! Your “high and dry” scenario would only be possible in a completely and perpetually glass-calm sea — ie, impossible!